Warung in Indonesian means small house, guesthouse or roadside eatery. They are everywhere in Bali and are brilliant for experiencing everything about Indo. The noise, the food, the traffic….the vibe. Near your correspondent’s spread in Ubud is a warung called Naughty Nuri’s. On every hard bargained taxi back to base I passed Nuri’s and it was pumping. Westerners and locals alike…milling about and punching out ribs. Nuri’s was a rib place. I like ribs. So I convinced Mrs botf and the three tin lids that Nuri’s was the place for our last dinner in Ubud. The ribs were brilliant (and it was just ribs – none of this vege stuff). 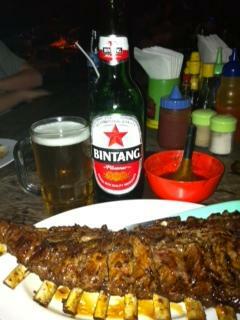 The ribs were BBQ’d out the front of the warung and then plonked in front of you for consumption. They had been marinaded in something fragrant, rich and delicious. AAA+. Beer of choice – Bintang. Even though it’s 5.45am, and I am crook as rookwood, I’m drooling.